Relax in style at the beach, while also staying protected! Bring the spirit of the sea in your indoor projects with this design. 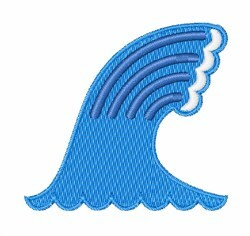 Easy Embroidery is happy to present Ocean Wave machine embroidery design which has 5856 stitches and is [60.21 mm x 60.17 mm] large. If you would like to view more embroidery patterns please search on our embroidery designs page.